I used to prefer law enforcement and former military type of heroes when I first started writing (much like in real life). A silent, strong-willed, protective type, ready to shield the heroine and take a bullet for her. I also wrote about a private investigator, reformed type whose journey included admitting his mistakes and changing his womanizing ways. Once I started writing contemporary Christian romance, I needed to expand my horizons in many senses, including finding new types of heroes. I wrote about a pro football player who went from dedicating his time to sports to renewing his faith, reconnecting with his family, and yes, finding love in Season of Miracles. I had to learn about football fast because I knew nothing about it! I loved writing about Dylan McGregor in Season of Joy, who worked in construction and was raising his little son alone. Dylan also adopted a foster teenager to fulfil his father’s dream. Dylan is a down-to-earth guy who wears his heart on his paint-stained sleeve, and his steel-toed boots always walk a straight path. But the main thing, he loves God with all his soul. And he gives it all to the small-town community of Rios Azules and to his family. I think single fathers are unsung heroes because every day and every moment they face obstacles of raising children alone with courage and kindness (As this is a romance, of course Dylan would have someone to love him and his sons in the end). When I started working on Season of Hope, the heroine, Kelly, was easy to write. The hero, on the other hand, turned out a challenge for both me and Kelly. Brandon was more flawed than any of my heroes, jaded, hurt, and a bit selfish in the beginning. His spiritual journey was slow, but I believe he did become a person capable of a selfless act, forgiveness, and overwhelming love. 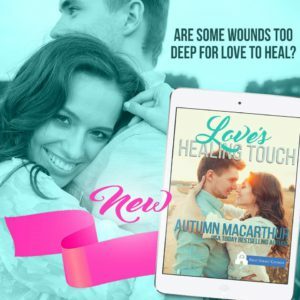 One of my favorite heroes ever is Adam in Autumn Macarthur’s new book, Love’s Healing Touch. Adam is a wounded warrior whose soul wounds are much worse than his physical ones. His story is one of the books that made me cry, but that much the sweeter was the ending that made me sigh blissfully! When it comes to nationality and ethnicity, I had heroes with Irish, Russian, and Latino heritage. For my next book, I’m thinking of making my hero a teacher, with Russian or Polish heritage. And I want to try writing about a cowboy hero once, strong, hard-working, a man of few words. So now I don’t have a favorite type of hero. The main thing for me is that they love God with all their heart, soul, and mind. And that they are capable of forever kind of love for their soul mate. What kind of heroes do you like? Is there a type you’d like to see more represented in romance? 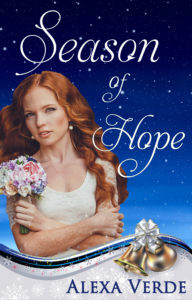 I’m offering a giveaway to one randomly chosen commenter to this post: 1 Kindle copy of my new release, Season of Hope. The winner will be chosen by 9:00 am CST on August 5th. Hi Alexa, thanks for sharing more about how you create a hero. I don’t have a preference for a hero, so long as he is genuine, willing to seek God first and is willing to show he loves the heroine. I teach Twentieth Century history- so a Russian or Polish character would be cool! Hi, Wemble! I love such heroes, too! I enjoyed studying history in school and in college, and I have huge respect for all teachers. My hero is the strong type for sure, no job preference, just a strong minded, strong willed man of God! Hello, Paula Dye! I liked the way you said, “strong minded, strong willed man of God.” Great description! My hero is a hard working man, whether it be a cowboy, mechanic or construction worker. Flawed but working on being a better man and of course growing in the grace of God. Agree about flawed heroes. One of the things I like the most in the books I read is the hero’s spiritual journey. It’s not about where they start from; it’s about how far they travel! It’s so great to see heroes change for the better and grow stronger in their faith. I’m fan of cowboys – strong and a bit maverick but also love me a God fearing geek – I’m married to one and he is the sweetest man ever – much to my surprise geeks are often the most devoted because of that whole – when we were teens the super smart band guy types weren’t “cool” – yet grown up – they are often the ones with best jobs and attention to details. Hello, Linda Sue S McKinney! I’m thinking of writing about a cowboy one day. :) I haven’t thought about a geek hero yet, but you just inspired me. They do sound wonderful. I need to put them on the list of potential heroes! I really don’t have a preference, but like a variety of heroes/heroines. A hero with a Russian or Polish heritage sounds really interesting! Hello, Becky! Thank you for your input! I’m glad you think a hero with Russian or Polish heritage is interesting. Thank you for the encouragement! I agree! Heroes can be found in everyday circumstances! That’s a great hero! Thank you so much for your kind words about my new book, and best wishes in the giveaway! Loving reading the sorts of heroes everyone prefers! And Alexa, thank you for mentioning my Adam. I’m touched that the story made you cry. It made me cry, too! Thank you, Autumn! And Adam was an amazing hero! I loved reading your book. I don’t have a type of hero concerning job preferences. I like the honest kind of guy, who could be anyone in real life, not to perfect of course, but someone seeking God’s will for his life and that’s willing to show the girl how much he loves her. I also don’t see why you had to change so much your heroes, a law enforcement or former military type can for sure still be heroes in Christian romance, no?! Hi, Laura! Great description of the hero! As for law enforcement and former military type, you’re totally right and they can be heroes in Christian romance, too. But I started my publication journey with writing Christian romantic suspense, and those and private investigator were the only kind of heroes I wrote about. 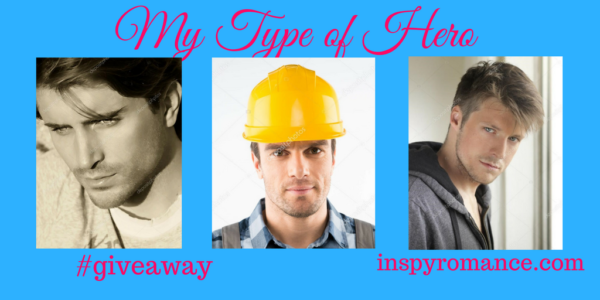 When I began writing Christian romance, I decided to add more professions. I hope that answers your question, and thank you very much for your input! I love a hero who is the typical muscled and handsome swooner- so much I married one! 😜 But I love to read about heroes that are masters of themselves, have integrity, are gentlemen, and able to overcome all obstacles and solve all problems – while maintaining humor and a great and mighty love for God. Thank you very much for stopping by! Got to have a muscular handsome hero in romance, lol. And all the better in real life, too. :) And wow, what an awesome description of a hero! And an accent never hurt anybody!! Hi Alexa! I agree with mimionlife, I enjoy reading romances about everyday guys and gals. Not necessarily any particular occupation, background, or being exceptionally strong or having a lot of baggage. As a German American Midwesterner, I enjoy the heartland or an international setting. My favorite hero this summer is Canadian Jordon in Heart of a Prince by Carol Moncado. So often in romance novels the hero is flawed and clueless. Jordon has heart in more ways than one. He is intuitive and really cares for the well being of Crown Princess Astrid and her daughter. Wished more men would be like that. I tried to raise my boys that way. Wished more romances had Jordon’s. (For more info read Carol’s July 14th post.) Fun reading the posts. Hi Renate! Thank you very much for sharing. I’m glad you’re enjoying reading the posts. Jordon sounds like a great hero indeed. I’m going to head to read Carol Moncado’s post. I appreciate your input! I don’t have a particular kind of hero that I like, but I like heroes who are a little rough around the edges. I like to see the hero smooth out his troubles with the help of the heroine. That’s an interesting take on the hero, Merrillee! I like the idea of the heroine helping the hero. Thank you for stopping by! I think heroes are those guys who genuinely love and care about others and show that love in a tangible way. That can be through the job they do or just how they approach life. Liblady, so true! They can show love for others through their attitude, their work, or simply everyday actions. Thank you very much for stopping by! So I also don’t have a favorite type of hero, but agree with you that the most important aspect for me is that “they love God with all their heart, soul, and mind… and are capable of forever kind of love for their soul mate.” Can’t find better words to describe this. And it goes both ways for my hero and heroine. Being an academic myself I value higher education and often prefer characters who went to college, but don’t really mind if there’s a good reason for not going. Hi, Priscila! Thank you so much for the kind words! Very nice of you! And I agree, having a higher education is always a plus. (Dylan McGregor didn’t go to college, but he did have a good reason for it.) I appreciate you stopping by! For full disclosure, I really enjoy your romantic suspense books and I’m yet to try your contemporary romance ones.. I guess I’ve been a bit reluctant lately to change genres for the same author.. the old ones seem to work great. I’m sure I’ll give it a try at some point. Priscila, thank you very much for reading my romantic suspense books, and I’m so glad you enjoyed them! As for trying my romance books, I truly hope you’ll be able to enjoy them, too! One of my favorite heroes is Landon from Karen Kingsbury’s Baxter Family series. He is so patient and loving toward Ashley and her son even when Ashley doesn’t make it easy to love her. Hello, Jessica B.! Karen Kingsbury is an amazing author! Thank you very much for sharing about one of your favorite heroes! I do enjoy heroes in law enforcement and construction. I’ve read quite a few books where heroes are lawyers and musicians and businessmen. But I would like to see more teachers and doctors as heroes!! Dylan sounds pretty good to me!! I’m so glad to hear it! Thank you for your kind words about my hero, Joan Arning! I love a strong, christian hero. It doesn’t matter what his job is, but I want him to be as “normal” as possible. It is hard to escape into an unrealistic book for me. Hello, Karen Loomis! I agree. If the book and the hero do not sound realistic, it sort of ruins the book for me. Thank you for sharing! I guess I pattern my heroes after my Daddy and my husband. My Daddy was a milkman for almost 40 years and my husband was a farmer for many years. It isn’t their occupations that I admire. Both of them had/have these qualities. Wonderful work ethics, honest to a fault, loyal and faithful to those they love, willing to help everyone and God fearing, God loving men! What a wonderful tribute to your Daddy and your husband! They sound like great, great men! Thank you very much for sharing!